The SRV has sent their own version of Cochrane, a cold-blooded, brilliant operative, to retrieve the document, pitting spycatcher against spycatcher. Dunn’s writing style is very different from many other authors in this genre. Having actually been a MI6 officer, Dunn is able to write scenes that feel authentic, and he tightly controls the pace so that you never feel like the story got away from him or progressed too quickly. He is knowledgeable about the weapons featured throughout the story and even includes a handy weapons glossary in the back of the book for your reference. The fight scenes and shootouts are incredibly brutal, but seem realistic, and will keep you turning the pages long past your allotted reading time. And though our hero, Will Cochrane, was trained never to show any feelings, he has a unique way of righting wrongs, bringing balance to a harsh and shadowy world. In preparation for reading SLINGSHOT, I went back to the beginning of the series and also read SPYCATCHER and SENTINEL. Though each book can stand on its own, I’m glad I read all three books in order. I learned so much more about our hero Will Cochrane and the other recurring characters and really enjoyed how Dunn controlled the release of information about each character, revealing small pieces of information along the way as the details became important to the storyline. Fifty pages into SPYCATCHER, Book 1 in the series, I called one of my fellow thriller reading friends and told him to go and buy all three books – I had found a new favorite author and was confident he would love this series. He ordered them all and has, in turn, recommended them to his friends as well. I highly recommend SLINGSHOT, as well as this entire series, to anyone who appreciates a well-written, fast-paced, on the edge of your seat thriller. You’re going to love this one! Want to win your very own copies of SPYCATCHER and SLINGSHOT? Since we will use email to notify the winner, all entries must include a valid email address. We are giving away physical copies of the books, so the winner will then be asked to provide a valid mailing address. The winner will be determined by random drawing on Monday, August 5, 2013 at 7p CST. That gives you a full week to enter yourself and tell all your friends, too! 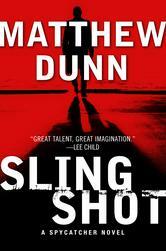 Updated Mon 8/5/2013 930p: Congrats Jeff T., winner of Matthew Dunn’s thrillers SPYCATCHER & SLINGSHOT! Thank you to all our participants, check back soon for more great giveaways! Superb review and post!! After reading your review, this book just moved up in my TBR pile!. Great job! Thank you for sharing your thoughts on this title. 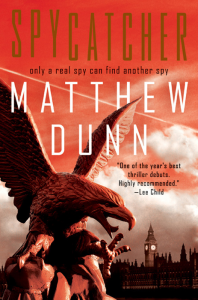 I would love a chance to win the new Matthew Dunn novel and write and post a review of it. I know well over 300 thriller writers very well and I am on a 1st name basis with almost all of them. I have attend Thrillerfest in NYC for the past seven years, every year it has been there. About 5 years ago a number of them came to me and asked if I would write a review for there up coming books which has been a great honor. Some of them are, Jon Land, Lisa Gardner, Michael Palmer and Dainel Palmer, John Lescrouat, Alan Jacobson, Lee Child and many more. So I would really give this my all and write a very good review. Thank you for the chance. My kind of book. Thank you for the giveaway. These look to be great reads; Thanks for the chance to win! Have not yet had a chance to read this author but would very much like to. Enjoy reading this genre. either book would be great!! would love to win! I love to read. and I love my paper books. and they look like they would be a great read. these book are compelling and fascinating. Thanks. I am always looking for a good read!!! Thanks for the opportunity! Finally finished Grisham’s Ford County. Now moving on to JP’s Sundays at Tiffany’s!